This 5-cent stamp honoring the naturalist John Muir was issued through the Martinez, California, post office on April 29, 1964. 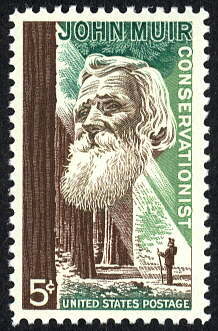 Designed by Rudolph Wendelin, the stamp portrays a redwood forest with a shaft of light coming down at an angle through the trees to highlight Muir with a hiking staff. Superimposed on this background is a drawing of Muir's face. This stamp was printed on the Giori press and issued in panes of fifty stamps each. An initial printing of 125 million stamps was authorized. This 5 cent postage stamp was issued on April 29, 1964. Scott Number: 1245. S.P.A. Journal article "John Muir" by Belmont Faries - Comprehensive background, with illustrations, about the design and making of the stamp. S.P.A. Journal letter to the editor (1965) by Edward N. Munns - relates the idea and lobbying for the commemorative stamp. Address by William M. McMillan, Assisant Postmaster General - a bit of "puffing" about Post Office success, but some interesting background on the Muir stamp. Arago - People, Postage, & the Post - National Postal Museum - John Muir Issue. Mellone's Specialized Cachet Catalog of First Day Covers (1960s, Vol, II (FDC Publishing Co, 1985), lists thirty-five different cachet designs for the First Day Covers for the 1964 John Muir postage stamp. See pages 173-174 from the Mellone Catalog listing the John Muir First Day Covers of 1964 (PDF). A complete listing of each of these First Day Covers, indicating the Mellone number and the cachet maker are provided in the listing below. (Non-Mellone-catalogued first day covers are provided at the end of this list.) The links contain scans with descriptions of most of these first day covers. M-12 - Chickering-Jackson M-24 - KJM Please contact us if you can provide a scan for any of the missing links! 50th Anniversary of Wilderness Act with John Muir Cachet (also recognizes 70th anniversary of "Smokey Bear." Please contact the harold.wood@sierraclub.org if you are aware of additional First Day Covers not listed here, or if you have any of the missing items from the Mellone catalog listing, for addition to this collection. Please e-mail your scan of the cover for inclusion, or if you do not have access to a scanner, please provide a color photocopy. Dedication Ceremony Program - includes schedule of events for the First Day of Issue ceremonies held in Martinez, California, on April 29, 1964. Post Office Poster - announcing first day of issue. First Day of Issue Maximum Card featuring Muir and several related park and forest conservation stamps. John Muir was subsequently honored with a 32 cent postage stamp in 1998, which also has many First Day Covers.